The Erzegebirge region of eastern Germany was very rugged and mountainous and relatively unsettled unitl the 15th centruy when silver and tin ore deposits were discovered. As people started inhabiting the mountains and founding new cities, mining was the way of life. As the ore deposites were depleted and related business declined, former miners had to look for new ways to feed their families. In addition to lace making and weaving, the inhabitants went into wood carving, producing toys and religious figures. Thus, the Erzgebirge region became famous for many Christmas traditions. 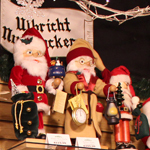 Nutcrackers, smokers, pyramids, and wooden arches are some of the many Christmas goods made in the Ore Mountains. Valley View Farms has carried quality lines of German nutcrackers for many, many years. We are proud to offer one of the finest selections of European nutcrackers on the east coast including Ulbricht nutcrackers, and nutcrackers from the Erzgebirge (Ore Mountain) region of Germany. No longer a mere “cracker of nuts,” we believe they are still a symbol of good luck. These elaborately crafted stern and stately nutcrackers make excellent gifts for people of all ages. These German incense-burning figurines were originally intended to bless and keep evil spirits out of the house. Today, they are used more for decorative and aromatic purposes. They include jolly santas and snowmen, woodsmen, gardeners, beer brewers, peddlers, and bakers. Their jovial styles make them perfect gifts for everyone! 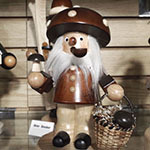 Our International Christmas Shop contains an incredible selection of hand-carved cuckoo clocks from talented artisans in the Black Forest in Germany. The impressive detailing on these heirlooms will bring enjoyment all year long. 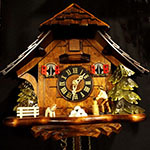 Valley View Farms has the ideal cuckoo clock for you. 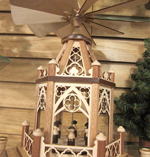 A variety of traditional Christmas scenes revolve as the heat from the candles turns the delicate wooden blades. These collectibles are available in painted or natural finishes and are perfect for the mantle or as a centerpiece. The unique old-world tradition of German pyramids will enhance your home this holiday. 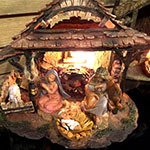 Come in and choose one of many crèches; start with an empty stable and build your own personalized nativity scene. Our Italian Fontanini figurine selection features an amazing variety of animals, holy figures, shepherds, angels, and more with distinctive sculptured detailing, painted hues, and mellow antiquing.